Humongous Mecha are inherently cool. Surely there's no way to make them cooler, right? Well actually, the mere addition of a Badass Cape can indeed make the coolest thing on Earth even cooler. On a human, a cape is commonly worn simply to look good; this is particularly true if one is Royalty. Superheroes often wear them to take advantage of the Dramatic Wind and simply appear visually impressive (though some turn them to more practical effects). And, of course, a cape can be useful to wrap around oneself if the weather turns suddenly cold or wet. On a robot, however, these factors are far and away cancelled out by the simple fact that, implausible though mecha already are, a cape would simply get in the way and not be very practical at all. But when you look this awesome, who cares? The final battle of the second arc of Tengen Toppa Gurren Lagann features the Dai-Gurren sporting a scaled-up version of Kamina's red Gurren-Dan cloak. In Lagann-hen, Super Tengen Toppa Gurren Lagann sports Kamina's cape made out of red Spiral flames, complete with the Gurren Brigade's symbol. Great General of Darkness from Mazinger Z and Great Mazinger wore a flowing, red-and-indigo cloak reinforced his badass image. The Nine Great Demon Generals in Transformers Zone. Transformers only sometimes have these in general; either because they're hard to animate, or because they'd typically get torn up in transformation. And in Beast Wars Neo, Great Convoy, high member of the Counsel of Convoys, IS a cape. With Optimus's head, but with ridiculously long aerials on the sides. The Gloucesters used by Cornelia and her royal guard in Code Geass. The Galahad from the second season was designed with a cape, but this never appeared in the animation. Gundam, surprisingly, has quite a few. The Rose Gundam in Mobile Fighter G Gundam had a (segmented metal) cape draping over its shoulders at some points. However, G Gundam is quite well known for its impractical designs. Sandrock and the Maganac Corps in Mobile Suit Gundam Wing often wear cloaks. This does arguably have a justification, as it could be used to protect the machine's joints from blowing sand as well as adding a small amout of camouflage. Officially, it's also an ABC Mantle (see below). After the Time Skip in Mobile Suit Gundam 00, Exia conceals its missing arm using a sort of half-poncho. Mobile Suit Crossbone Gundam: The majority of weapons used at this point in the Universal Century timeline are beam weaponry, against which the best defense is a beam shield - and while this is effective, most of the fighting is in space, where a bright beam shield is highly visible. However, the cloaks used by the Crossbone Vanguard (and the X series Gundams in particular) are ABCnote Anti-Beam Coating Mantles that act as ablative armor vs. beam weapons - and on top of that, they're black, which gives some degree of stealth and/or distraction in space. Delta Astray's Gundam Astray Out Frame has the Shooting Cloak, which covers its whole body and acts as active camouflage; however, since Out Frame is geared towards photography and journalism, the main function of the cloak is to keep Out Frame out of battles. A few MS have metal parts (often taking the form of wings) that can wrap around the body like an armored cloak. This list includes Master Gundam, Deathscythe Hell (both versions), Astray Blue Frame 4th, and Dynames. In Iron Blooded Orphans, Gjallarhorn officers put a red cape onto their Grazes whenever they want to arrange a formal duel. Crank Zent has the cape put on the shield, which he throws away to signify a duel's beginning. Carta Issue has the cape put on her Graze Ritter's right shoulder, which fell off when Mikazuki Augus slammed her unprepared. The Gyancelot in Gundam Build Fighters Try Island War has a beam cape, which can deflect beams and cut things with a sweep. Escaflowne, Scherazade, and pretty much every other customized or named Guymelef in The Vision of Escaflowne. The bad guys had capes that functioned as cloaks of invisibility as well. 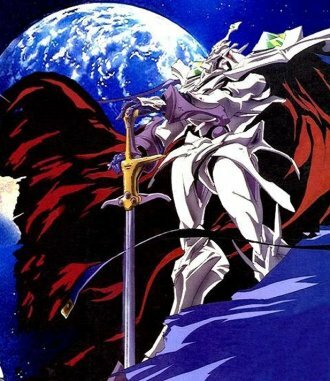 It does make some sense on the Escaflowne since it becomes the wing's membrane while in dragon form. Getter Robo - specifically, Getter 1 uses it to fly. In the Armageddon OVA, the cape is used in a whip-like fashion to wrap around a Mass Produced Getter Dragon's head before Ryoma punches it clean off. In Neon Genesis Evangelion, when Asuka is introduced, her EVA is covered by a tarp. She wraps the tarp around her robot for a cape-like effect when she makes her battle debut. And it is awesome. Ramrod from Saber Rider and the Star Sheriffs. It even has a Nice Hat. Found amongst the Humongous Mecha-Mooks summoned by Precia to protect her Ominous Floating Castle at the end of Magical Girl Lyrical Nanoha's first season. She was going for a knight theme from the looks of them. Volume four of the Appleseed manga takes this to the logical conclusion. At one point, several police Landmates show up wearing clothes: A jumpsuit with gloves. The Appleseed Databook specifically states that this is to protect them from dust. When Dan crashes the Bigfoot Basketball game in the first episode of Basquash!, his Bigfoot mecha is wearing a tarp as a makeshift, but still cool, cape. Its sequel, DieBuster, has the semi-autonomous mecha Dix-Neuf wearing a cape duster jacket which is apparently rigid unless the pilot is in control. It also serves as a covering when the mecha is in rocket mode. In Shinkon Gattai Godannar! !, Ken's Blade Gainer wears a cape, or rather what's left of it to emphasize his mysterious badass attitude. And maybe to protect against sand. When Scavenger first shows up in Transformers Armada he wears a large, body-covering cloak in the manner that a human might wear one to hide his identity. It actually looks pretty silly. And Megatron's dream world shows him wearing a sash fastened with a Decepticon-sigal brooch. In Break Blade, a group of mecha in the desert is seen briefly wearing cloaks. They're not really capes, and are probably actually more for camouflage than to look cool, but they're still giant robots wearing huge pieces of cloth over their shoulders. Borcuse's golem along with the golems in his retinue all have full size cloaks, in order to conceal all the various extra weapons added to the golems frames.Delphine has one with the same function. Metal Robotnik in Sonic the Hedgehog: The Movie. While technically not mecha, many Mega-level Digimon, most famously several Royal Knights, are mecha like in size and appearance. Obviously, they wear enormous capes. Probably the most recognizable is Omnimon, whose size can be seen in this clip (for those of you who are impatient, skip to 2:04). Gigantic Formula has the Jupiter-II (no, not that one). GUN×SWORD has Bolkain, who has a shredded wraith-like cape that can neutralise laser weapons and absorb them. The impracticality of mecha clothes is Lampshaded in Super Dimension Fortress Macross. A pilot dresses his Humongous Mecha in a giant alien's uniform to infiltrate an enemy ship. The mecha almost immediately begins overheating as the uniform clogs its vents and the fabric gets tangled in the joints. The mecha seen in the first episode of ICE wear long cloaks. The Transformers: More Than Meets the Eye: Chief Justice Tyrest wears a green cape. One of Twelve later sports a red one. James Roberts explained that pre-war capes were a sign of class, fabric was uncommon and therefore expensive. During the war fabric was plundered from planets the Decepticons invaded. In Undocumented Features, Corwin Ravenhair pilots a heavily modified Zaku in a Mobile Fighter G Gundam exhibition fight. This Zaku has a flex-metal cape that produces an Anti Gravity field, allowing its maneuvering thrusters to let it fly even on Earth. In An Entry with a Bang!, when the battle of Port Krin seems to be going quite wrong, Tony Dansel has his team equip their Mechs with improvised capes. The Transformers: The Movie put Starscream in one for his coronation... and a Cool Crown, too. They've since become an iconic part of the character's look, and it's possible to get them as aftermarket accessories for the action figure, as well as PVC figures, statuettes, and even an official (from TakaraTomy, anyway) Masterpiece toy of Coronation Starscream. Which is not to say that Starscream has the gravitas to make this look work. Word of God is that he didn't just have these on for his coronation, but had actually had his body modified to allow him to transform into a new alternate mode, complete with all those bulky gubbins still on him. Meaning that he was vain enough to expect to have a cape on full-time.It's anyone's guess where it was supposed to go when he transformed, given that he was still supposedly some kind of aircraft. Sentinel Prime from Transformers: Dark of the Moon; his back kibble is designed to look like a cape. And Megatron's new design for the film has him wearing a cloak. Los Dark's Fake Gokai-Oh from the Kaizoku Sentai Gokaiger movie. Pteraiden-Oh from Zyuden Sentai Kyoryuger gains a cape and One-Way Visor as part of an Evil Costume Switch when it's wielded by Dogold; once its proper partner Kyoryu Gold breaks free, the cape is gone for good (and the visor slides up to reveal a more normal Sentai robot face). The backglass for Robot shows a Humongous Killer Robot wearing a giant red cape while clutching a woman in its hand. At least one Tau commander has decided to mount a loincloth on his battlesuit. A mech commander in Dragonmech commissions a velvet cape for his 120 foot tall mech. It gets lit on fire two weeks later, with predictable results. Vezon from BIONICLE wears a black tattered cape, possibly to hide his lack of a spine. The set version of Karzahni wears a black cape (it's the same cloth piece used for Vezon) as well. Furno XL from Hero Factory wears a black cape. Aussenseiter in Super Robot Wars - justified in that it uses the cape to hinder the enemy sight as it blasts the enemy. Which doesn't explain why it has a brand new cape every time it uses that attack...cape dispenser? Also, the Vysaga, which can also deflect enemy fire with it. SRWJ's Granteed grows one out of pure energy with certain attacks. The Ardjet in Zone of the Enders: the 2nd Runner has a functional cape which can rearrange into a coffin or separate into an Attack Drone swarm. The Legend of Zelda: Skyward Sword has two robotic humanoid minibosses. Both have capes. Billy Lee Black in Xenogears had a cape for his Gear, Renmazuo. It looked odd on PS1 graphics, when everything else was kind of blocky. The Gears piloted by the Ethos organization (which is based on the Catholic church) wear hoods and robes resembling those worn by real-life penitentes during Holy Week in Spain. The final boss mech of Sonic Lost World has a large green cape made of energy. In The Inexplicable Adventures of Bob!, Roofus takes to wearing a large sash after he becomes a member of Princess Voluptua's royal court. In The Mech Touch, Ves is forced to find a way to add a cape onto his design for the "Marc Antony" after his second customer, a spoiled noble, forcefully requests him to. Not exactly a cape per se, but Lockdown from Transformers Animated briefly wears a rather fashionable poncho for a few seconds in one episode, before throwing it aside to attack Prowl. Given that the episode was called A Fistful Of Energon, this was probably a Shout-Out. Red Alert of the same series, however, has her 'clothing' thicker, made of metal, and apparently forming a decent portion of her vehicle mode. Most "Shellformers" have this feature. Fans tend to be divided on it because it indicates laziness on the designers' part. Alpha Trion of Animated also bears a cape, though a quick glance at his design doesn't seem to support any sort of transformation, possibly a Shout-Out to G1. Alpha Trion, Optimus Prime's "father" in Transformers: Generation 1, wears a cape, but he doesn't have to worry about it getting caught up in the works when he transforms because he's so old that he doesn't turn into anything: he was created before Cybertronians could transform. At least, the original series' version was. In how this relates to other series that have him but make transformation something all Cybertronians have always had is unknown. Beast Machines' Megatron has a segmented metal one to go with his "interface harness". It's mostly there to wrap around him to hide the features of his Beast Mode and tends to spread out like wings whenever he transforms into or out of it.